There are two ways that I find that I get better as a food photographer. One way is to take food photos and the other is to look at really good food photography, with a critical eye. And to be honest, I’m not sure which way is better. Putting together a food shoot is not something I can do every day, but looking a good food photography is. I’m going to share with you my 2-step method for improving my food photography skills, without actually shooting food. I’ve been doing this since I was in photography school and it’s worked really well for me. Back then I used The Workbook and the blackbook, but now, I use the internet. This method is simple, easy, and it’s something you can to whenever you have some time throughout the day. And I guarantee that if you do what I’m suggesting here, after a month, you’ll be twice the food photographer that you are now. A swipe file is a collection of food photography that you personally think is amazing or outstanding. Pick images that you just love to death and you’d want your photos to look similar too. Where do you find these images? The place I go is the “101 Best Food Photographers” web site. Actually, this is the exact reason I created this list in the first place. I put together this page so that I’d have a place to go for inspiration. At this point, go into your portfolio and select five of your favorite images and add them to the folder. I like to throw my own stuff in there to see how I stack up… Then, upload all the images to your phone so that you always have them with you. That way, you can go through the following exercise every time you have a free moment or whenever the mood strikes you.. Step #2 Browse the images one by one and ask yourself the following questions. Why does this photo seem special to you? Is the surface important to the success of the shot? What is the overall color pallet of the photo? Are the props dominate or of little importance to the shot? Do the props seem to be new or used? What colors are the plates or dishes? Are there napkins? If so, how are they folded? Is there silverware? If so, how is it arranged? Would you consider the crop to be tight or loose? What is the camera angle? Is the composition casual or regimented? Are there large areas of negative space? Is there a lot or a little depth of filed? Where do you thing the photographer focused? Why do you think the photographer made these decisions? Is the light even across the entire photo or are there shadowed areas? Can you see the shape or size of the light source in the highlights or reflections? Does there appear to be more than one light being used? Why do you think the light was placed where it was? Is the color temperature of the photo natural, warm or cool? Is the shot dark and moody or light and airy? Then repeat with each photo on you Iphone. What you’re doing here is looking for common denominators, things that you think might be making these images special. Look for trends. You’re trying to figure out what the food photographer might of been thinking and why here or she did what they did. I’m telling you… If you do this on a consistent basis, your food photography will improve immensely! Great post! Thanks for sharing. I start to collect the photos just now! Thanks for this. I was doing somewhat the same but I like your list. I have found that I like shots with a high contrast edge! I know that clients don’t always want what I like but that is one thing I really prefer. I also like a very high level of definition within the in focused area. I also like a little larger depth of focus then some. Great tip. Thank you for extending yourself to teach others. Thank you for taking the time and effort to post this. I already have a folder on my computer with a bunch of food photographers that I like in it. You, of course, are one! A private board on Pinterest works well as a method of doing this too. Pintrest I find is a good way of storing future ideas, you can get ideas from the photographs and merge them. You can always save the images off of Pinterest and add them to your collection, sure! 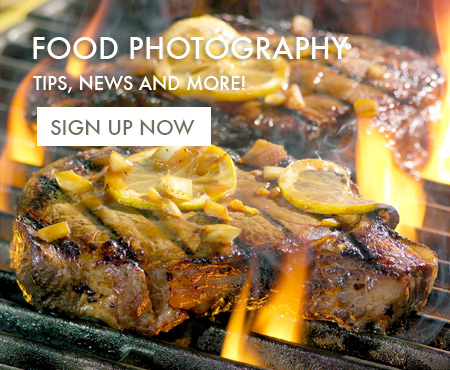 Get food photography tips, news and more.